Sewing the cuffs and collar is a very important final moment for any product. If you do it poorly, can be spoilt the overall look of the dress. Besides, these items are often worn and may need to slightly update them. For this you need the parts to cut out and bend along the bottom edge. The outer half should be made more dense. Today for this purpose there is dublerin adhesive, adhesive cloth and adhesive interlining. Their density should match the material of the cuffs. If the fabric is too thin and transparent, it is better to buy at the store interlining or "cobweb". For coarser fabrics suitable dublerin. Glue the fabric must be cut precisely according to the contour of the part to be sealed. The adhesive must be cut so that there is no seam, otherwise it will thicken the product. So the release of extra amount of the adhesive base of the allowances is not desirable. Attaching the adhesive, fold the cuff in half and press. The sleeves need to lay a couple of folds with a width of approximately 2 cm each. To lay the folds on both sides so that they were distributed evenly, then the sleeve will not twist in the future. After that the strengthened part of the cuff applied to the bottom of the slice of the future sleeves and fasten with pins. After part of the product will be sour cream, allowances cuffs should be free. Now you can remove the pins and press the seam allowance of primaqiune in the cuff side. After that, the same way to press the seam allowance from the inner part of the cuff. At the final stage, you need to stitch a fabric through primaqiune cuff 1 cm If the involves style, make this line any width around the edge. Importantly, the sections of the collar and the neck of the product exactly the same. To attach the collar better from the neck seam. Sew the collar only to be jotted strap. Shoulders products must be fully Stacey and serged, and the plank press. If we stand-up collar, it is put on the wrong side of the shirt face. Now pin up to the neckline of a ready-made collar. To do this, expand the bar jokes to her stand. 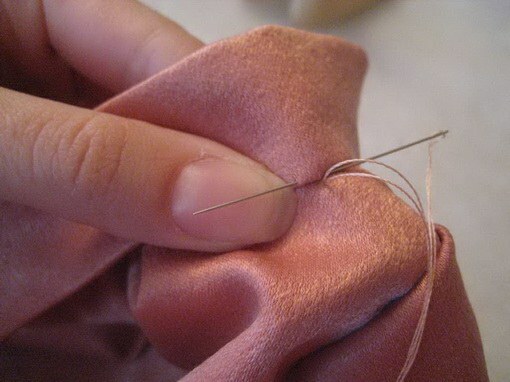 Make a stitch over the pins, then remove them. At the junction of the straps with the neckline you need to make nadechka. This will enable you to resaturate allowance, if the stitching is too dense. Need to make sure that the seam allowance over the short side of the rack was empty. Prestativa collar, be sure that the neck of the shirt was not formed folds. Seam allowance of inner stand you need to cover up on the rack. On the rack and on the bar lay a line in 1 mm. the Seam on both sides of the collar must pass exactly along the edge the same on both sides the distance from the edge (1 to 2 cm).